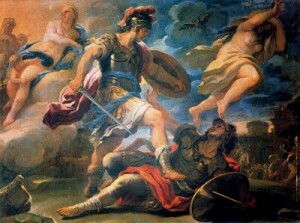 The history of war literature in the West is a familiar one – the great heroic epics of Homer, streamlined and historicized by Virgil, adopted and adapted by poets like Marlowe, Shakespeare, and Tennyson, and arriving relatively unchanged in theme and attitude at the land-mined doorstep of WWI. Up to that point, war in literature focused on promoting cultural unity and creating drama through a combination conflict, fear, love, courage, and hatred in the face of death. Then anti-war literature exploded, and a tradition of angry, disillusioned voices rose to challenge the predominant heroic narrative. Between 1914 and 1918 attitudes to war shifted greatly, from Brooke’s “Now God be thanked Who has matched us with His hour” to Sitwell’s “What more fitting memorial for the fallen/ Than that their children/ Should fall for the same cause?” Famous poets like Owen and Sassoon and novelists like Remarque and Graves altered the theme forever, but one of the earliest and most crucial pieces of anti-war literature came from a less well-known – but uniquely fascinating – English journalist named Charles Edward Montague. Montague wrote for the Manchester Guardian, opposing the Boer War and, in the summer of 1914, arguing against British involvement in a war with Germany. Once war was declared, however, he threw his support behind the government and turned his talents to promoting enlistment. After months of urging others to volunteer, his new conviction spread even to himself. But three hurdles stood between Montague and his new goal. He had a good, ‘useful’ career; he supported his wife and their seven children; and he was 47 years old. Firm in his belief, however, he dyed his grey hair brown, lied about his age, and was accepted into the Royal Fusiliers. Arriving in France in November 1915, Montagne was immediately appalled by the conditions of the trenches – though he wrote thankfully home that the rats ‘don’t actually try to eat live humans.’ He was soon invalided out, returned a year later to the Front, only to be sent away under an order that banned men over 44 years of age from trench work. 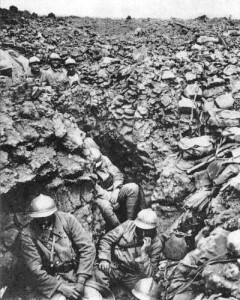 Nevertheless, he got enough of life in the trenches to see that something had changed irrevocably. In 1922, Montague wrote the autobiographical novel Disillusionment. The novel opens with the prophetic statement: “Now that most of our men in the prime of life have been in the army we seem to be in for a goodly literature of disappointment” (1). He acknowledges that at earlier times “the best art” has been the product of disappointment – Burne-Jones, Arnold, Rossetti, to name a few melancholiasts – but he added the caveat that their “broken-toy view of the world” was only “their nice little way with the public” (1). They write of ashes and dust, but not from any real experience. The higher the wall from which you tumble, he suggests, the larger the bruises. Montague views each aspect of the war through the lens of literature. The men happily adjust to a simpler life, unlike Touchstone in the Forest of Arden; they are obedient to their new orders in a child-like, “Dantaen repose”; and they have a clear goal, as, quoting Tennyson, a man “imputes himself” (6-7). In the early days of 1915, the “sane anti-climax of real life” seemed twice as good as the climax of “Hugo or Verne.” Montague thinks of Milton, and by then the conclusion is inevitable: “That was the paradise that the bottom fell out of” (11-12). Disillusionment quickly sets in. 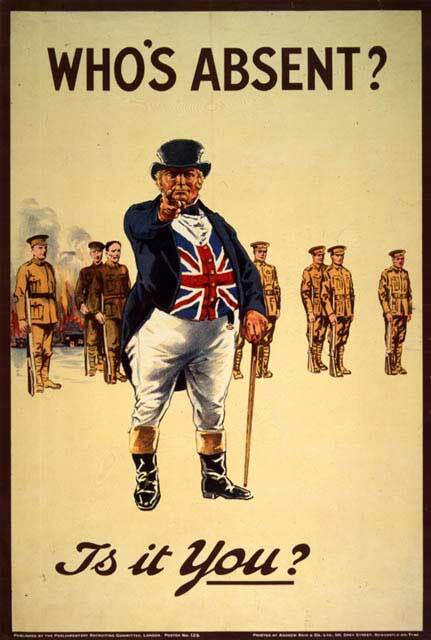 Drill sergeants only lead the men as far as the next pub, “like Tam o’ Shanter”; bribes are accepted and expected; newspapers deliberate mislead the public and unintentionally assist the enemy (“Shakespeare seems to have known what there is to be known about Great War of 1914-18. And he was not censored”). Worst of all, men sleep on duty or desert their posts. Montague writes ominously that the early volunteer “in his blindness imagined that there was between all Englishmen then that oneness of faith, love, and courage” (16; 28; 4). most people believe so little now in anything or anyone that they would find it hard to understand the simplicity and intensity of faith […] or the certitude felt by hundreds of thousands of men who are now dead that if they were killed their monument would be a new Europe not soured or soiled with the hates and greeds of the old. […] So we had failed – had won the fight and lost the prize […] The lost years, the broken youth, the dead friends, the women’s overshadowed lives at home, the agony and bloody sweat – all had gone to darken the stains which most of us had thought to scour out of the world that our children would live in. Many men felt, and said to each other, that they had been fooled (180-2). Something else happens with ‘the enemy.’ The hero of the novel, a thinly-veiled Montague, shares his surprise at finding that a captured German trench contained no evidence of their nefarious practices: “no poison to put in our wells, no practical hints for crucifying Canadians; only the usual stuffing of all soldiers’ pockets – photographs and tobacco and bits of string and the wife’s letters, all about how tramps were always stealing potatoes out of the garden, and how the baby was worse, and was his leave never coming?” Montague concludes: “One trembles to think what the really first-class haters at home would have said of our army if they had known at the time” (143-5). Nevertheless, the killing continued, the gruesome slaughter of men and horses marching into waiting machine-guns. The tradition of heroic literature helped shore up a culture of Britishness, although this nationalism was rudely battered: “The authentic flame might still flicker on in the minds of a few tired soldiers and disregarded civilians. Otherwise it was as dead as the half-million of good fellows […] whose credulous hearts the maggots were now eating under so many shining and streaming square miles of wet Flanders and Picardy.” Men, regardless of citizenship, who “lived like foxes or badgers, dodging their way from each day of being alive to the next,” would, after the fighting, be eternally bound together (179). 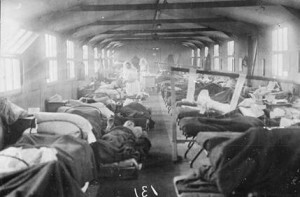 The base depots stages a different sort of nightmare, as soldiers lay either grievously ill (“triumphant and chuckling”) or in various stages of performance (“semi-successful, suspect, and tediously over-acting”), and the Brass Hats meanwhile recline in comfort (“respectable old bubbles”). The honour, the chivalry, and the heroism are nowhere to be found in this war: “One leaf that had gone pretty yellow by now was the hope of perfect victory – swift, unsoured, unruinous, knightly: St. George’s over the dragon.” Soon, the sight of any victory at all seems impossible. With crushing irony, Montague absolves the generals on the grounds that this was a war that refuses to “conform to proper text-books [and] not dreamt of in Staff College philosophy” (58-61; 124; 45). Even the Brassest Hat does not escape his bitter gaze. 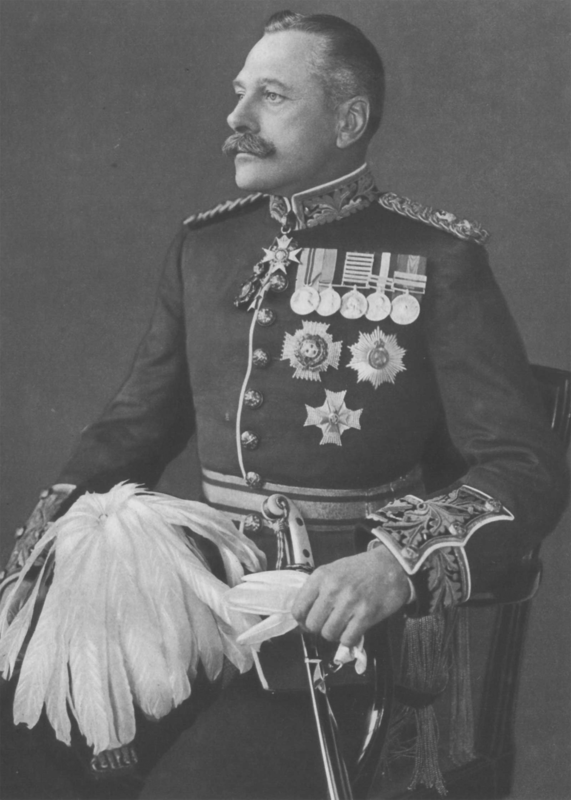 “Haig,” he writes, “was a name and no more.” No one knew what he has done or left undone, and so the soldiers feel they should give him the (faintest) benefit of the doubt: “It might not be he who had left the door lying open, unentered, for two nights and days, when the lions had won the battle of Arras that spring, and the asses had let victory slip till the Germans crept back in the dark to the fields east of Vimy” (132-3). Montague wrote of the GHQ at Montreuil, where modern war had pushed the generals further and further away from the fighting, and from the men: “Walking among its walled gardens, where roses hung over the walls, or sitting on the edges of its rampart, your feet dangling over among the top boughs of emblossoming trees, you were not merely out of the war; you were out of all war.” Coupled with a mental distance from the actualities of war (training with an emphasis on parry-and-thrust techniques and single-shot rifles), the soldiers began to question the ability of their betters: “The faith of the general mass of the English common people in them was now pretty near its last kick. The lions felt they had found out the asses” (32; 47). Montague firmly sets out his “lions/asses” dichotomy, and there is little room in it for the Germans. The sudden shift of the enemy is familiar from the poems of Sassoon and Owen. The only German mentioned in Owen’s poems is the ‘friend’ he laments killing in “Strange Meeting.” Instead, commanders, politicians, and non-combatants come across as the enemy. Montague notes the “nimble politicians” who rush out to turn the ‘men who won the war’ into votes: “the golden memory of the dead before the living could come home and make themselves heard” (179). For Montague, from the ashes of the war a new kind of chivalry arose – respect for the fellow soldier, no matter which side he fought for. ‘I hope to God,’ an oldish and highly non-combatant general said, in discussing the probable terms of peace with a younger general who had begun the war as a full lieutenant and fought hard all the way up, ‘that there’s going to be no rot about not kicking a man when he’s down.’ The junior general grunted. He did not agree. But he clearly felt shy of protesting. Worshippers of setting suns feel ill at ease in discussion with these bright, confident fellows who swear by the rising one (178). 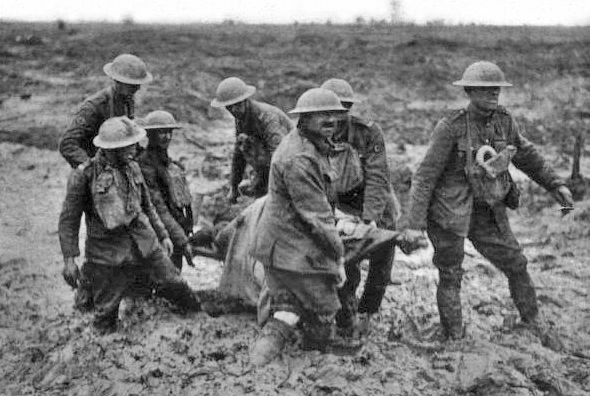 These newspapermen, politicans, and non-combatants betrayed the values that the soldiers volunteered to die for. To writers and poets with the benefit of hindsight, this transfer had a wearying inevitability. “The war had burnt some and warmed others, same as fire tortures you or comforts you, depending on whether you’re in it or in front of it,” wrote Louise-Ferdinand Celine in Journey to the End of the Night. Ted Hughes argued that the enemy was not Germany, but a ‘nightmare world’ of society at home; after the protest poems, “the next step, logical but unimaginable, would have been a rising of the ranks, a purging of the mechanical generals, the politicians, the war-profiteers, everything brass-hat and jingoistic both civilian and military.” But to those men in the trenches during the war, the realization was sudden and cruel. 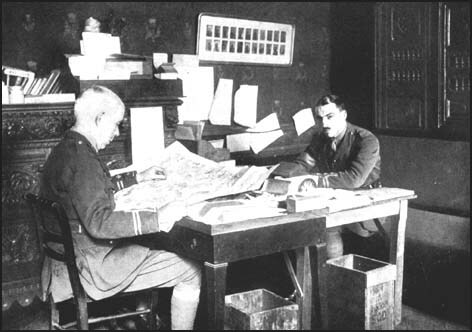 Montague tells how men at the Front imagined the war ending: “Each had his particular favourite vision. Some morning the Captain would come down the trench at ‘stand-to’ and try to speak as if it were nothing. ‘All right, men,’ he would say, ‘you can go across and shake hands’” (173). This is not how WWI ended. “The ‘cease fire’ order on Armistice Day had forbidden all ‘fraternizing.’” He describes the cavalry brigadier in command at Cologne, and his “gesture towards the conquered was that of the happy warrior, that of Virgilian Rome, that of the older England in hours of victory” (174-5). So now the “pre-war virilists” and the “literary braves” who felt that they had “supped too full of peace, have died in their beds, or lost voice, like the cuckoos in June, and a different breed find voice and pipe up” (219). Again the politicians leaped to take the credit, and again the tradition of heroic literature gave their actions context: “Each little demagogue had got his little pots of pitch and sulphur on sale for the proper giving of hell to the enemy whom he had not faced. Germany lay at our feet, a world’s wonder of downfall, a very Lucifer, fallen, broken, bereaved beyond all the retributive griefs which Greek tragedy shows you afflicting the great who were insolent, wilful, and proud.” Montague adds, “war hath no fury like a non-combatant” (180; 220). There is only one thing for it. There must still be five or six million ex-soldiers. They are the most determined peace party that ever existed in Britain. Let them clap the only derbies they have – the Covenant of the League of Nations – on to the wrists of all future poets, romancers and sages. The future is said to be only the past entered by another door. We must beware in good time of those boys, and fiery old men, piping in Thessaly (220-1). Throughout Disenchantment, Montague acknowledges the power of literature to misrepresent the brutal truth of war. He quotes at length Homer, Virgil, Shakespeare, Milton, and Swinburne. Whether he felt that literature had long been responsible for such perversion, or whether he feared the specific horror of WWI would be cast in the usual heroic light, is uncertain. In any event, he needn’t have worried. 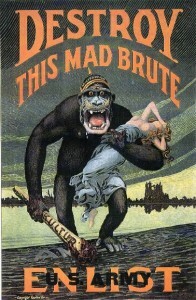 Disenchantment led the way for a torrent of angry and bitter accounts of WWI. Montague crystalized and formalized literary protest against war, but these ideas themselves – revulsion, bitterness, disillusion, betrayal – were being aired by ‘Men of Letters’ from the moment that war was declared. Next month we look at “The Legacy of Conscience” that together they helped create. This is the second installment in the year long series War and Literature in the Western World by John Owen Theobald. John, originally from the East Coast of Canada, holds a PhD from the historic University of St. Andrews and now lives in London, England. London 1932, repr. 2010, trans. Ralph Manheim, 181. This is a fascinating article about a largely forgotten contemporary correspondent of the Great War, it is so easy to never get beyond the war poets. The archive at the Museum is testament to how many men used literature, to detail, rail against or try to comprehend the things they experienced.